The house has a rambling feel but is cosy and manageable. 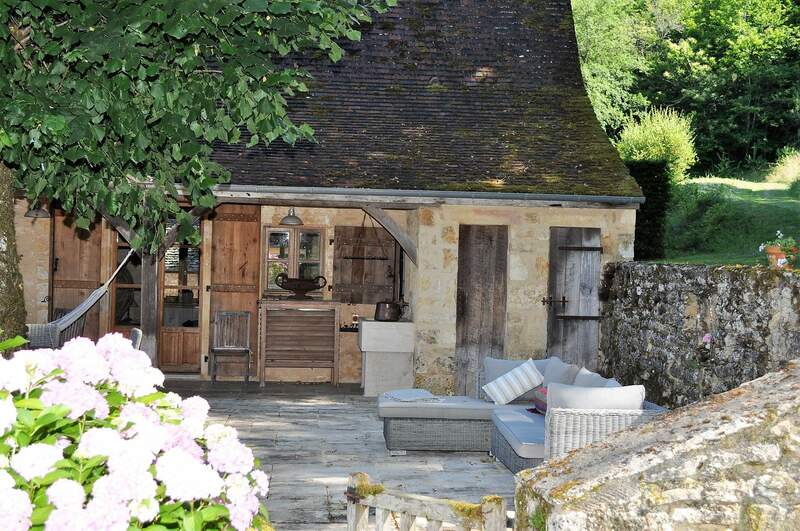 The main house sleeps 8 in 4 double bedrooms, 2 bathrooms (1 en-suite) and there is a further Gite that sleeps two (less comfortably) and at an extra cost. The main house has a large living/dining room, and a well appointed modern kitchen, and has been renovated to an excellent standard with much detailed oak panelling. Designed for all seasons, it is cosy and welcoming in winter and has lovely covered and open terraces for relaxing and outdoor entertaining in summer, with a BBQ on the main terrace. Wifi and TV are included. The garden is sloped and nestles into the natural ancient forests that surround it. There is an infinity swimming pool of 15m x 7m with a large pool house with its own bar, bathroom and relaxing family games room. (The pool room can sleep teenagers if necessary at an additional cost). There is an additional outside room with a wonderful wood burning bakers oven and dining table. Perfect for Pizza making or late night dining. Walking and biking are easy as is canoeing in The Vezere. There are many local markets, abbeys, chateaux and a wealth of ancient and historic sites nearby. The Lascaux Caves are 5km away. Combe Cuite is an especially tranquil and relaxing place to be, as you may discover whilst listening to the owls chatting across the valley in the evening. Please note that Combe Cuite is not recommended if you have very young children who may be unattended. The pool has an electric cover but there are slopes and drops in the garden. "First impressions of Combe Cuite’s breathtaking position above a verdant oak forest set the pace for a holiday of relaxation and private luxury. The ancient stone tiled house and surrounding gardens have numerous places in which to soak up the peace and quiet of this spectacular part of France in the sunshine. Hanging out on sofas around the huge pool or reading in a hammock under the veranda, it is hard to drag yourself away from the house and go and explore the surrounding area - although it is worth the effort. To mix it up you can head into the pretty nearby town of Montignac to stock up at the market or linger over dinner at any one of the good local restaurants. However, we enjoyed stretched out lunches and candlelit dinners on the lovely terrace best with only the sound of the odd bird or roe deer flitting through the forest to break the peace. The house has been furnished and decorated beautifully with every mod con you could possibly need and the fabulous stone pizza oven was a bonus. Endless space to get away from each other as well as enjoy noisy evenings together with a large pool house for those that wanted to party on."